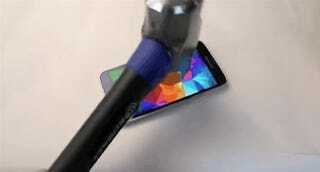 So, some guy thought it would be cuhraazy to film himself smashing a new Samsung Galaxy S5 with a hammer. I wonder, though, if he expected his hammer to hit something that it probably shouldn't have hit. As you can see, it all starts pointlessly enough. Dude smashes the front of a new phone with a hammer. It's when he flips it over, not realising what's actually inside a battery, that the phone is able to take some vengeance to the grave.